Vasilios Hatziioannou Wins the Mega Stack Main Event! 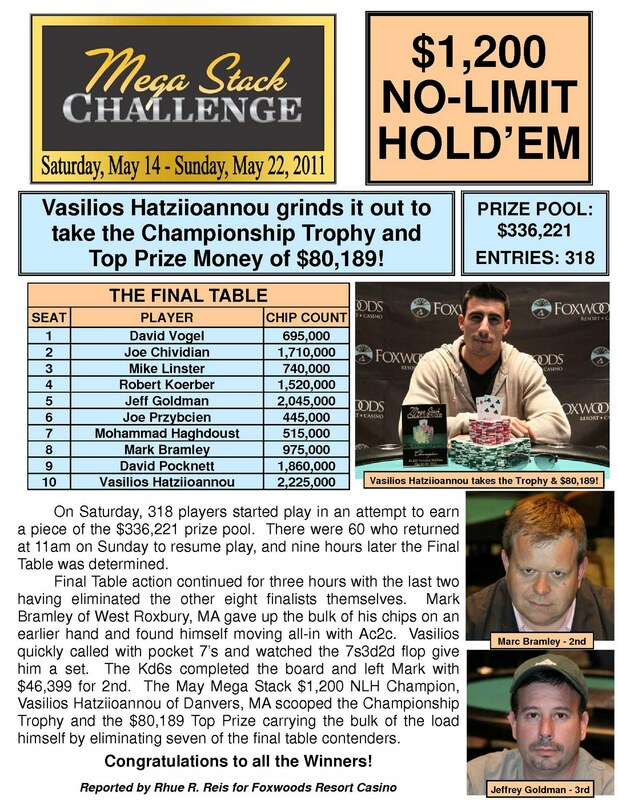 The champion of the $1,200 No-Limit Hold 'em Foxwoods Mega Stack Challenge Main Event is Vasilios Hatziioannou. For his victory, Vasilios takes home the trophy and the first place prize of $80,189. Congratulations and we will see you in August for the next Mega Stack series here at Foxwoods! After being crippled the previous hand, Mark Bramley moved all in with [Ac][2c] and was called by Vasilios Hatziioannou holding [7c][7d]. The board ran out [7s][3d][2d][Kd][6s] and Hatziioannou improved to a set of sevens to win the pot. Mark Bramley finishes the Mega Stack Challenge Main Event in 2nd place and takes home $46,399. The board came [Jd][Th][4s][6d][9s] and Hatziioannou won the pot to eliminate Goldman in 3rd place for $29,587. The board came [Qc][Td][6s][Ac][3d] and Hatziioannou won yet another monster pot. David Vogel was eliminated in 4th place for $23,704. Haghdoust held the lead before the flop, but Bramley took the pot after the board ran out [9d][8c][7c][2h][Qd]. Mohammad Haghdoust was eliminated in 5th place for $18,492. The players in the Mega Stack Main Event are now on a 10-minute break. When play resumes, the blinds will be increased 25,000-50,000 with a 5,000 ante. With five players remaining, the average stack is now 2,544,000. After a flop of [Qs][9s][8s], Robert Koerber moved all in with [Qc][Th] and was called by Vasilios Hatziioannou with [Ks][Qd]. The turn was the [7h] and the river came the [As]. Hatziioannou took yet another big pot to extend his chip lead over the rest of the field. Robert Koerber was eliminated in 6th place for $14,962. The board ran out [Tc][9d][5c][2c][Qc] and Hatziioannou won the pot to eliminate Chividian in 7th place for $12,440. Bramley was caught trying to steal the pot with only a gut-shot straight draw against Linster's set of eights. However, the turn came the [6s] and Bramley hit his straight. The [4d] on the river did not complete Linster's full house and he was eliminated in 8th place for $10,087. It was folded to David Pocknett in the small blind, who raised to 95,000. Vasilios Hatziioannou called from the big blind and the flop came [Jd][Js][8c]. Hatziioannou had outflopped Pocknett's queens. The turn came the [9d] and the river was the [Ah]. Hatziioannou won the pot and eliminated Pocknett in 9th place for $8,247. With nine players remaining, the average stack is now 1,413,000. Joe Przybcien's pocket aces had been outflopped by Hatziioannou. The turn was the [Kh] and the river came the [Jc]. Joe Przybcien was eliminated from the Main Event in 10th place for $5,715. Cards are back in the air after dinner break at the Foxwoods Mega Stack Main Event. The blinds are now 15,000-30,000 with a 5,000 ante. With 11 players remaining, the average chip stack is now 1,156,000. The players are now on dinner break in the $1,200 Foxwoods Mega Stack Main Event. Play will resume at 7:45pm EST. With 11 players remaining, the average is now 1,156,000. We are down to 18 players and will be doing a complete redraw for seats at the final two tables. When play resumes, the blinds will be increased to 10,000-20,000 with a 3,000 ante. The blinds in the $1,200 Mega Stack Main Event have been increased to 8,000-16,000 with a 2,000 ante. With 21 players remaining, the average chip stack is now 606,000. With 26 players remaining, the average chip stack is now 489,000. We just lost a player and are down to the final 35 in the Mega Stack Challenge Main Event. All players are now in the money and guaranteed at least $2,757. We are now down to 36 players and the final four tables of the Foxwoods Mega Stack Main Event. The final 35 spots finish in the money. The players in the $1,200 Foxwoods Mega Stack Main Event are now on a 10-minute break. With 40 Players remaining, the average chip stack is now 318,000. The blinds in the Mega Stack Main Event have been increased to 3,000-6,000 with a 500 ante. With 50 players remaining, the average chip stack is now just over 254,000. The final 35 players will finish in the money. You can view the live stream of the feature table by clicking "Watch LIVE Video" at the top of the page. Day 2 of the Mega Stack Challenge Main Event is now underway! The blinds are starting at 2,500-5,000 with a 500 ante. There are 60 players remaining and the top 40 spots finish in the money. Play has come to an end on Day 1 of the $1,200 Mega Stack Challenge Main Event. There look to be 62 players remaining in the field with the top 35 spots finishing in the money. Play will resume tomorrow at 11:00 am EST and will continue until we have a winner. Final chip counts and Day 2 seating assignments will be posted as soon as they are available. With 80 players remaining, the average stack is now 159,000. This will be the final level of play on Day 1. The players in the $1,200 Mega Stack Challenge Main Event are now on a 10-minute break. With 99 players remaining, the average chip stack is now 128,500. With 121 players remaining, the average chip stack is now 105,100. With 144 players remaining, the average stack is 88,300. Olivier Busquet has been eliminated from the Foxwoods Mega Stack Main Event. Despite taking an early chip lead, Busquet found himself on the short stack just before the dinner break when he ran his pocket kings into his opponent's pocket aces. Live Stream Back Up After the Dinner Break! The players in the $1,200 Foxwoods Mega Stack Challenge have returned from dinner break and cards are back in the air. The players in the $1,200 Foxwoods Mega Stack Challenge Main Event are now on dinner break. Play will resume at 7:30pm EST. There are approximately 198 players remaining and the average chip stack is now 64,200. A short stacked Ronnie Bardah got his last few chip in the pot before the flop with A-Q against his opponent's pocket eights. However, Bardah was unable to improve his hand and was eliminated from the Mega Stack Main Event. The players in the Mega Stack Challenge Main Event are now on a 10-minute break. Tournament officials are currently coloring up the green 25 chips. With 225 players remaining, the average chip stack is now 56,500. The blinds in the $1,200 Mega Stack Challenge Main Event have been increased to 400-800 with a 75 ante. With 236 players remaining, the average chip stack is now 53,900. We had a total of 318 players in the $1,200 NLHE Mega Stack Challenge Main Event. When play resumes, the blinds will be increased to 250-500 with a 50 ante. Payouts will be posted momentarily. While play continues at the $1,200 Mega Stack Challenge, it is getting harder to find a tournament clock in the room. Per the request of players, most of the tournament clocks have been switch to the Boston Bruins playoff hockey game. The blinds in the $1,200 Mega Stack Main event have been increased to 200-400 with a 50 ante. Registration will be closing momentarily and the final numbers and payouts will be posted as soon as they are made available. The players are just wrapping up their first break of the day. The blinds are being increased to 100-200 with a 25 ante. The blinds have been increased to 100-200 at the $1,200 Mega Stack Challenge Main Event. We are now over 300 players in today's field with registration still open. The blinds in the $1,200 Mega Stack Challenge have been increased to 75-150. There are now over 270 players registered for today's Main Event. With registration open for the first few hours of play, there are already over 250 players in today's field. Players started with 40,000 in chip and the blinds are currently 50-100. Levels 1-12 will be 40 minutes in length with Levels 12 and up being 50 minutes. Once we have reached the final table, the levels will be one-hour in length. $1,200 Mega Stack Challenge Main Event Underway! The $1,200 No-Limit Hold 'em Mega Stack Challenge Main Event is now underway. Players start with 40,000 in chips and the blinds are now 50-100. 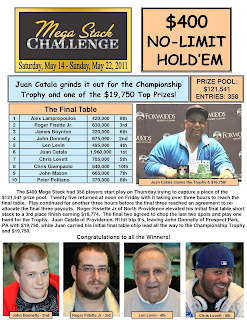 Juan "Majic" Catala Wins the $400 Mega Stack Challenge!! 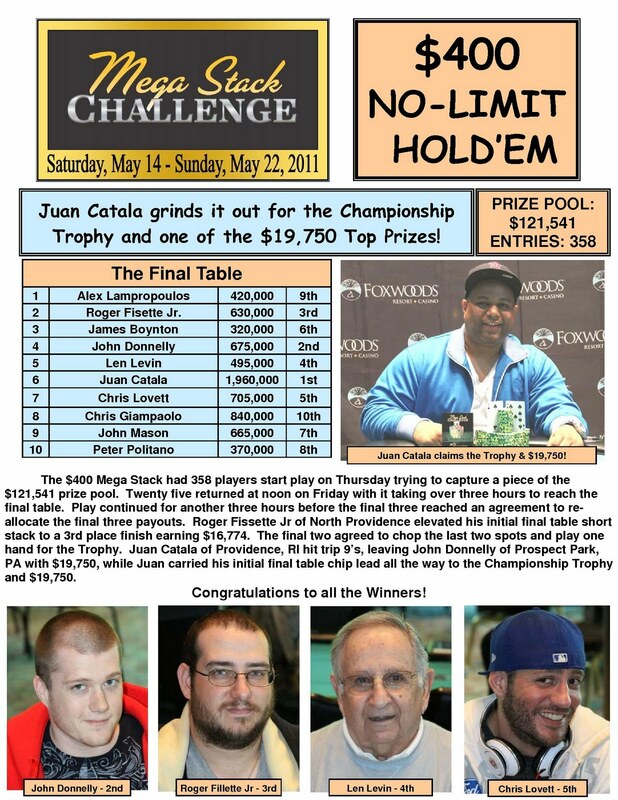 Juan "Majic" Catala is officially the champion of the $400 Mega Stack Challenge. He takes home the trophy and $19,750!!! John Donnelly and Majic Catala came to an agreement on an even chip chop and ran out one hand to determine who would take home the trophy. Catala won the hand and John Donnelly officially finishes in second place for $19,750. After losing a big pot just moments earlier, Roger Fisette moved all in from the button with [Ks][2s] and was called by Majic Catala in the big blind with [9c][9s]. The board came [Jc][Jh][9d][Tc][8h] and Catala won the pot with a flopped full house. Prior to the dinner break, the three players agreed on a redistribution of the payouts. Roger Fisette takes home $16,744 for his 3rd place finish. The three remaining players in the $400 Mega Stack Challenge have decided to take a short dinner break. Cards will be back in the air at 7:20pm EST. The board ran out [Jd][Td][4h][5h][2d] and Fisette took the pot with his set of fives. Leonard Levin was eliminated in 4th place for $8,508. The board ran out [Ac][Jh][9s][Jd][4c] and Fisette took the pot with his full house. Chris Lovett was eliminated in 5th place for $6,624. The board came [7c][5c][5d][3d][Jd] and Levin's AK held up to win the pot and eliminate James Boynton in 6th place for $5,348. Mason was in the lead until the board ran out [Ad][Td][9c][3s][6c]. Lovett paired his nine to win the pot and eliminate Mason in 7th place for $4,436. The board ran out [Kd][Qs][7d][9h][3s] and Levin won both the side and main pots with his pair of jacks. Peter Politano was eliminated in 8th place for $3,585. Alex Lampropoulos moved all in with [Jd][Jh] and was called by Majic Catala, who woke up with [Kc][Kh]. The board ran out [9s][4h][2s][6h][8c] and Catala took the pot with his pair of kings. Alex Lampropoulos was eliminated in 9th place and takes home $2,934. After being crippled the hand before, Christopher Giampaolo was just eliminated in 10th place. He was all in for his last 25,000 in the small blind against John Donnelly and Majic Catala. The board ran out [Ad][Qh][3d][Kc][8d] and Donnelly turned up [Ac][9d] for a pair of aces. Catala threw away his hand and Giampaolo tossed his [Td][4h] into the muck. Christopher Giampaolo was eliminated in 10th place for $2,005. We are down to the final table of the $400 Mega Stack Challenge. The players in the $400 Mega Stack Challenge are now on a 10-minute break. When play resumes, the blinds will be increased to 12,000-24,000 with a 4,000 ante. With 14 players remaining, the average chip stack is now 511,000. We are down to the final two table of the $400 Mega Stack Challenge. $400 Mega Stack Day 2 Now Live Streaming! Day 2 of the $400 Mega Stack Challenge is now underway. There are 25 players remaining and the chip average is 286,000. Play has come to an end on Day 1 of the $400 Mega Stack Challenge. There are 25 players remaining and the average chip stack is now 286,000. 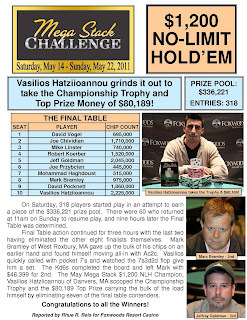 Final chip counts and Day 2 seat assignments will be posted on www.FoxwoodsPoker.com as soon as they are available.